Welcome to our page! My name is Megan and for the hikers and backpackers out there, my trail name is Contour. I travel with my canine companion, Whoopi, who is my hearing dog. As a child I was a big tomboy and loved camping, but I truly got into backpacking when I was 15 years old and completed a 9-day course with an outdoor education school called Outward Bound. While in college during a backpacking elective course – I learned of the Appalachian Trail and my interest in the trail has been piqued ever since. Unfortunately I never pursued hiking the 2,183 mile Appalachian trail since I did not think it would be possible for me to do so as I was not confident in the idea of being able to do by myself. You see – I was born with moderate to severe hearing loss in both ears. Even though I wear hearing aids – it is still a struggle to keep up with what’s going on around me. I usually cannot hear the phone ring unless it’s right next to me, I sleep through alarm clocks, I do not hear my name being called out, I have slept through fire alarms and severe thunderstorms, and cannot hear people coming. Fortunately, a few years ago I encountered an information booth about Canine Companions for Independence. CCI is a nationwide non-profit organization who trains service dogs, hearing dogs, assistance dogs, and facility dogs for those with disabilities at no cost to those who graduate with their trained companions. 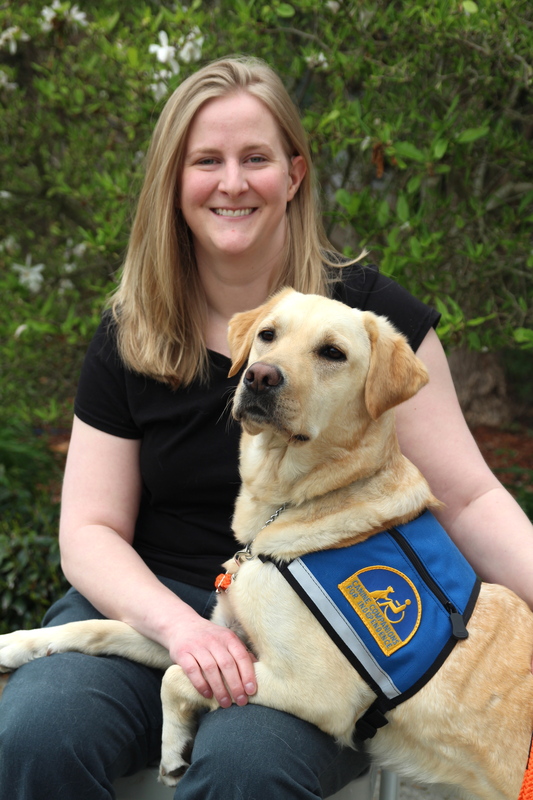 In January of 2012 I applied for a hearing dog and through a year long application process – I was invited to the Santa Rosa center to participate in the Hearing Dog Team Training class in March of 2013. During this two week course – my life was changed forever when I was matched with Whoopi. She is a beautiful golden/labrador retriever cross and is currently four years old. Prior to us being matched, she was raised by her fabulous volunteer puppy raiser until she was about 18 months old before she was turned in to CCI for advanced training. Puppy raisers are volunteers who train these puppies from the adorable 8 week old stage until the puppies are 18 months old. By the time these puppies are turned in for advanced training – these dogs are able to complete over 40 commands that are essential to every service and assistance dog. It has been estimated with all of the training hours from puppy raisers and trainers, supplies, vet costs, and food that these dogs need – it costs up to $50,000 for each dog to make it through advanced training. Since I have gotten Whoopi – I have been able to walk through life and feel confident knowing that I have her to alert me of what’s going on around me. With her – I have the added independence to allow me to pursue the dream of thru-hiking the Appalachian Trail. Thru-hiking is a term to describe those who hike the trail from one end to the other within a ‘season,’ and it takes approximately 6 months to hike the 5 million steps. Whoopi and I will be thru-hiking the Appalachian Trail starting next spring in 2017. To help pay it forward to the organization and community that has given so much to me, I wanted to help raise money for CCI. My goal is to participate in such a way that will allow someone else to have the same opportunity for independence through these wonderful companions. My hope is through this fundraising campaign and this thru-hike for CCI – to raise at least $20,000 for CCI. Please help me achieve this goal by donating to CCI through the CCI image shown on the top-right of this page. This year I am in the process of some serious penny pinching since I will be unemployed for up to 6 months next year, and I am working on getting the remaining gear that Whoopi and I would need for the trail. I have determined that the cost of the trail is anticipated to be approximately $5,000. This is the budget for food for both Whoopi and I, mailing costs for our re-supply boxes, lodging and dining when we make it to towns for our mail and supplies, emergency replacement gear for gear that fails or doesn’t work for us, and transportation to and from the trailheads when we need to go to town. If you would like to help offset our costs – please click on our logo shown on the right side of this page. 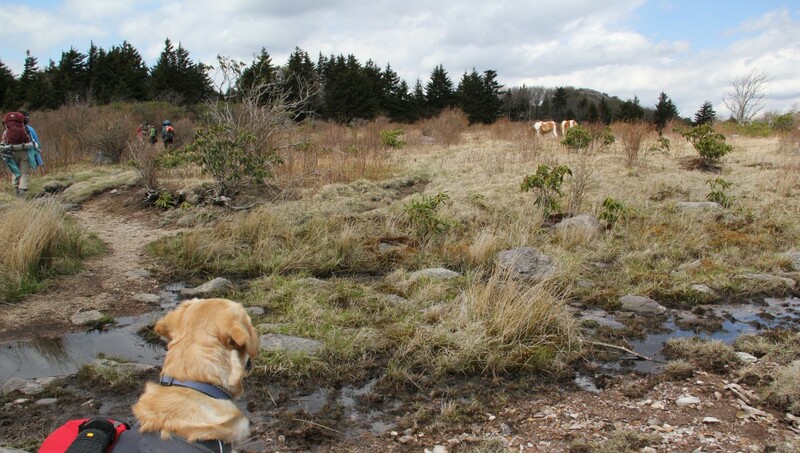 If you would like to contribute anything to our trail fund – it will help us tremendously in our journey to raise funds for Canine Companions for Independence. If you would like to contribute to our in any other way at all – please contact us at contourandwhoopi@gmail.com. Thank you so much for your time and we hope to see you on the trail! To see some of what CCI does – please watch these Eukanuba videos of CCI Hearing Dogs being trained! Hi Megan! Thanks for following my blog this morning. I’ve looked through your blog and would love to chat with you about either us interviewing you or you writing a feature for Hearing Loss Magazine about your hearing loss, your hiking endeavors and your future plans to thru hike the Appalachian Trail. I’m a freelance graphic designer/photographer/writer and I produce the magazine for the Hearing Loss Association of America. Email me at dyerdesign@aol.com if you’re interested? I’ve talked with my editor about you and she said let’s get in contact with you. Thanks! Absolutely! I’ll be in touch with you via email. Thank you so much for commenting and following our story! This is awesome! I have always wanted to hike this trail as well but have been discouraged because of my hearing loss as well. Especially figuring out how I would be able to protect my devices during inclement weather. I am so excited to even find out about this! I definitely understand and relate to that! I’m currently planning on keeping my hearing aids in a pelican case or waterproof bag for inclement weather and humid days. Since I have another pair of ears with me – I’m not as concerned about not having the ‘aids’ in all the time. 🙂 When I get to camp and when there are other people around – I will definitely wear them. Megan, thanks for following my blog. Like you, I am a total newbie to this blogging thing. Of course, I had to check out your blog and I found it truly inspirational. And Whoopi is a magnificent looking dog. My favorite dog I have ever owned was a Lab/Retriever mix and she was awesome while she was with my family and I. Good luck when you hike the AT and I post a lot on the way, I’ll be following. Thank you! We will do our best to keep posting. It’s been a crazy couple of weeks but hopefully next week I’ll be able to get back to a semi-normal schedule in order to keep blogging. I look forward to reading your blog as well! Want to Support Our Hike? Day hike time!!! Needed this hike and the weather ended up being great today! P.S. Whoopi has a new trail name - “tenderfoot” as she does not care for gravel and try’s to find the smoothest path when possible 😝🤪.